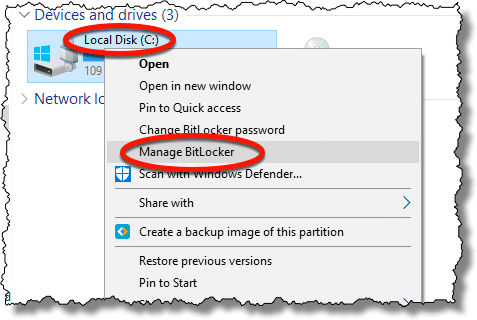 How Do I Turn Off BitLocker on a Drive? - Ask Leo! BitLocker is a fine approach to encrypting hard drives--especially the system drive. It's also easy to turn off if you decide you no longer need it. OK, I encrypted my drive. Now I’m tired of the additional hoops I need to jump through just to access my machine. I decided I don’t need or want BitLocker. How do I turn it off? I’m going to assume you’re talking about BitLocker full-drive encryption, that your system drive is encrypted, and that the “additional hoop” you have to jump through is the extra password you need to specify when you reboot your machine. Assuming you understand that anyone who steals your machine can access all the files on it, even without knowing your Windows log-in password, turning off BitLocker and decrypting your drive is a snap. Boot your machine and log in to Windows. Run Windows File Explorer and right-click on the drive you want to decrypt. In the resulting context menu, click on Manage BitLocker. In the resulting dialog, click on Turn off BitLocker. 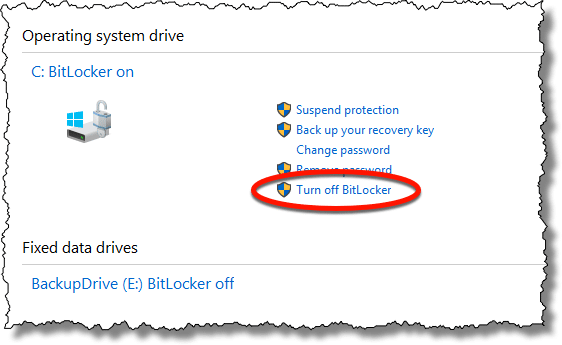 Click on the Turn off BitLocker button in the subsequent confirmation message box. The system goes to work decrypting your drive. As the prior message said, decrypting can take a while. How long depends on the speed of your hard disk, the speed of your computer, and the amount of data you have stored on that drive. After a while, the process completes. You’re done! BitLocker has been turned off on that drive, and the data decrypted. 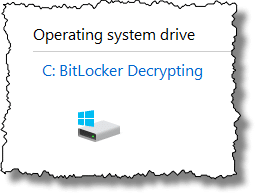 Use BitLocker to Bypass Potential Self-Encrypting Drive Vulnerabilities - Headlines to the contrary, it's BitLocker to the rescue to protect yourself from some vulnerabilities discovered in drives providing hardware-based encryption. « Previous post: Are There Hidden Files that Save Every Keystroke I’ve Ever Typed? I was thinking to buy a TPM before trying to encrypt with BitLocker, but why I do not sell it in Japan. Since it can not be helped, it was not amazon.co.jp but was about to create an account on amazon.com. I felt BitLocker did not have to do it at all.